The iScan Mini is the latest model in the illustrious line of video processors from DVDO, which includes the Edge Green and the iScan Duo. 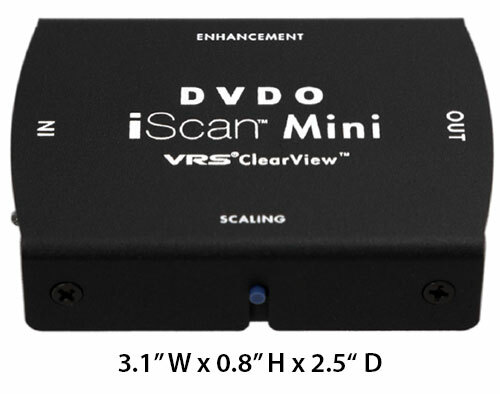 Beyond the video enhancements provided by those earlier products, the iScan Mini supplies a 4K adaptive scaler powered by Silicon Image's proprietary VRS®ClearView™ technology. All of these features are packaged in a small discreet metal box that can easily be tucked behind your Ultra HDTV. The iScan Mini would be ideal for a videophile on a budget but hankering to jump into the 4K video world. Let me explain. The iScan Mini is one of those devices that can slightly improve the picture quality of a high-end 4K TV. Remember, one of the reasons that you are paying the premium for the top of the line Ultra HDTVs is because they include high powered video scalers and processors that are often comparable to the iScan Mini's. But if you can't afford a first class 4K TV and decide to try a much less expensive second tier model, the iScan Mini should be able outshine the scalers and video enhancements in that TV and therefore noticeably improve the picture quality. Of note, the iScan Mini is compatible with 1080p TVs and projectors, upscaling and enhancing SD, 720p and 1080i content. I imagine that it would be extremely useful as an add-on to a big screen projector. DVDO takes the Mini moniker to heart. The compact matte black metal box fits in the palm of my not huge mitt. On the front face of the iScan Mini is a Scaling button, which manually cycles through the Scaling presets (Auto, DVDO, Off). On the back are two more buttons. 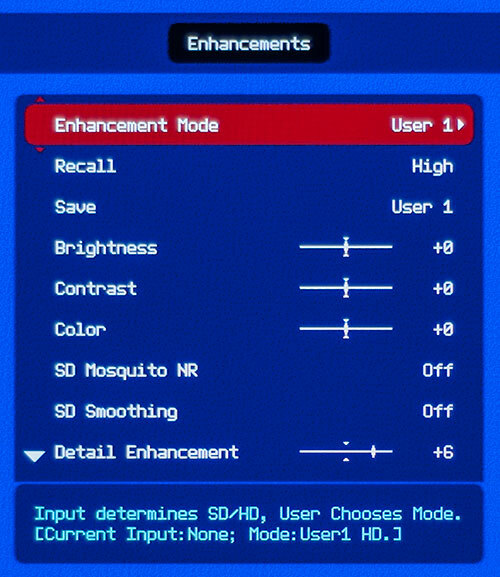 Click on the Enhancement button and you cycle through the Enhancement presets (Low, High, User1, User2, Off). Recessed next to it, the F/W (firmware) Update button is pressed to enter Update mode when the iScan Mini is connected to your PC. On the left side of the iScan Mini are the Input connectors. The HDMI 2.0 In is also compatible with MHL 2.0 sources. It accepts up to 4K HDMI or up to 1080p/60 MHL. The box can be powered by directly plugging the supplied USB cable into a USB port on the TV. If that is not available, the cable can be attached to the included USB wall adapter. There's also a 5V/3A connector option (with a wall adapter, sold separately) to charge a connected MHL device. On the right side of the iScan Mini are the Output connectors, one HDMI 2.0 Out and one S/PDIF Optical Digital Audio Out. In the iScan Mini menu, you can strip the audio from the video and send it out to a device like an AV receiver or a sound bar. Also on this side is an input for an IR receiver. If you plan to place the iScan Mini out of sight from its remote control's IR beam, then you can attach an IR dongle (sold separately) to the box and position this IR receiver in the remote's range. The video enhancement technology is bundled inside this mighty mite and the options are revealed on the iScan Mini's multi-layered On-screen display (OSD), which pops up when you plug in the box to your TV and hit the Menu button on the iScan Mini's remote. The menu provides six sub-menus: Tools, Audio, Information, Enhancements, Scaling, and Modify TV EDID. In the Tools menu, you can select from 22 pre-loaded test patterns, like 8x3 Color Bars, Brightness/Contrast and Frame & Geometry, which will assist in adjusting your display. 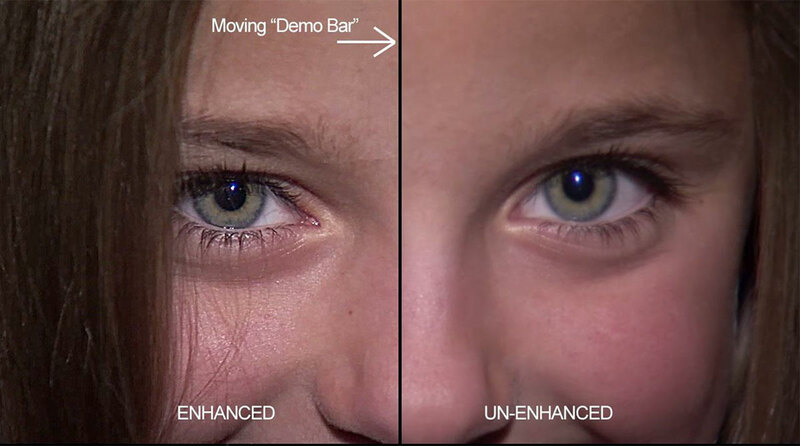 In addition, DVDO offers a Demo Mode where you can compare Enhanced next to Un-enhanced video either in a static split screen or a fast or slow moving bar. If after a tweak here and a few more there, you find you and your picture are lost in choppy waters, the Tools menu also provides the lifesaver, a Factory Defaults reset option, which you might need after exploring the Enhancement menu. To begin in this next menu, as you can see from the diagram below, not all of the Enhancements are applied to every type of video source (SD, HD, or 4K). The iScan Mini identifies the video source and adjusts the menu accordingly. DVDO also provides four default presets, two each (High and Low) for SD and HD sources. The User's Guide also instructs you on how to save your favorite settings into a User1 or User2 memory for recall later. The Guide also does a good job of illustrating the effects of the various enhancements. You definitely should read the well-written Guide before any serious fine tuning. The Scaling menu provides three options: Auto, DVDO (Manual) and Off. In Auto, the iScan Mini reads the native resolution of your TV or projector and attempts to scale the source material to that while maintaining the frame rate. 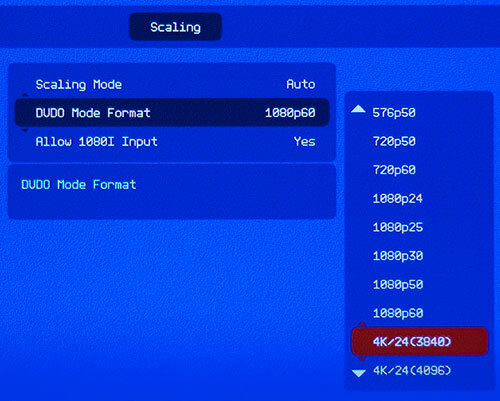 In DVDO (Manual) you can choose your output resolution and the scaler will attempt to comply. Please note that the iScan Mini does not deinterlace or perform Frame Rate Conversion. For example, it will not convert 24Hz film content to 30 or 60Hz. Below is a list of the SD, HD, and 4K (3840 x 2160 pixels) video formats that the iScan Mini can output. I will not endeavor to explain the Modify TV EDID menu. Unless you are a professional installer, I suggest that you steer clear of EDIDs. I already have mentioned the ability to strip the audio from the video and send it out the Digital Audio Out of the iScan Mini. The Audio menu is where you set the type of audio. The Guide explains the details. The non-backlit remote control is extremely valuable in traversing and accessing all of the iScan Mini's options. The numerous dedicated buttons allow you to directly step through features like the Test Patterns without first opening up the menu. I found that occasionally that I had to press the buttons on the remote more than once before the menus responded. It served as a reminder that you need a clear line of sight from the remote to the iScan Mini. If you plan to hide the box behind your TV or in a cabinet, be sure to finish your adjustments first. Or you can buy an IR receiver (the manual gives you a link to an inexpensive third party source) and leave it unimpeded. The basic cable connections and setup are easy. 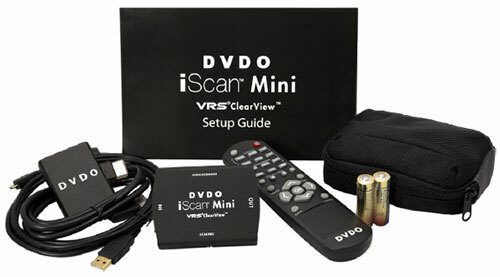 DVDO suggests that you position the iScan Mini as the last piece of equipment before the signal goes to your TV or projector. You might encounter some idiosyncratic handshake glitches between a source like a set top box or AV receiver, which may require a certain order of turning on accessories. And once again, if your equipment necessitates fiddling with EDIDs, read the manual or call a professional installer. Once connected, the fun starts, tweaking the picture. With the supplied test patterns and the video enhancement settings, you have a good toolset to fine tune your display. DVDO provides default settings, like the Low and High Enhancement presets, that are good reference points for further adjusting. Remember, if you have sources with different resolutions (SD and HD), you can adjust settings for both of them and keep them separately stored away in User memories. As you begin to tweak the setting, go into the Tools menu and set the Demo mode to either the Slow or Fast Moving Bar, which will display an Enhanced and Un-enhanced comparison. The rest is up to your aesthetic. For example, I find the High Enhancement preset to go too far. Low yields a much more pleasing result to my eye. Of course, different sources may need more or less oomph. The User Guide is a valuable resource in navigating the menus and options. I will admit that I am at a disadvantage in judging the iScan Mini's ability with 4K upscaling because the 4K TV that I have right now is a very top of the line model with high-end scalers and enhancement tools. When comparing the iScan Mini's output to this Ultra HDTV's, I simply cannot perceive a noticeable improvement. Then again, you would hope that if you are paying top dollar for a new 4K TV that you wouldn't need to shell out more money for an enhancer. But if you buy a less expensive and less fortified 4K TV, then the addition of the iScan Mini, with its superior video scaler and processor, may definitely be worth the cost. 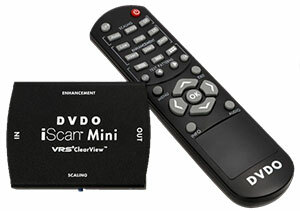 The iScan Mini can also work its enhancing magic on HDTVs and HD projectors. I believe that this powerful little box would be a great match for a projector with an underwhelming scaler and processor. Buying the iScan Mini for enhancing a high-end 4K display may not make dollars and sense. But with a lesser performing 4K or HD display, the Silicon Image VRS ClearView technology integrated into the iScan Mini should clearly improve picture quality. This DVDO iscan mini is a complete waste of money. Does very very minor improvement of streaming but nothing with blu ray and DVD picture improvement. The Darbe Darblet blows this away. Don't waste your money. I promise you will regret it.